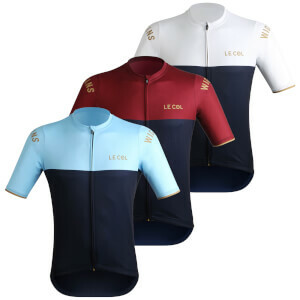 The Le Col by Wiggins Hors Categorie Jersey is the pinnacle of the entire collection. 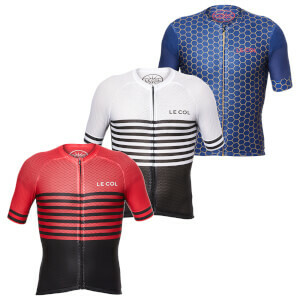 Your go-to for the widest range of rides this jersey uses soft touch Meryl fabric for the best combination of technical performance and luxury feel. A fabric picked specifically for its performance in a wide range of temperatures, this fabric has both high wicking and cooling properties while in hot weather and insulation against the cold in colder weather. Inside all the seams have been cover stitched to ensure a low profile, negating any irritation while riding and a soft Lycra chin guard and collar ensures the jersey is comfortable when fully zipped up. A quality lock down puller allows for ease of use at high speeds and a silicone gripper at the hemline and comfortable arm grippers ensure the sleeves and hem stay firmly in place at all times during your ride. Additional features include three large pockets with a waterproof hidden valuables pocked on the rear right hand side and gold reflective strips in the back for visibility while riding.